The Restoration of the gospel of Jesus Christ is still rolling forth, sweeping every country and sounding in every ear. Most often what opens those ears is a simple act of charity. Last year Brent Brown travelled from the USA to the UK on vacation with his wife. They visited sites he had known from serving his mission in England nearly 40 years earlier, and specifically St Michael Anglican church on top of a hill in the majestic Lake District in Cumbria. There the local vicar had agreed with the then mission president, Ellis Ivory, to host a mission conference in the 12th century church. Now four decades later, Brother Brown found that St Michael and All Angels was raising funds to repair its ancient bell tower, but was far from its goal. Upon his return home, he called on other missionaries who had served in the England North West Mission (now the England Manchester Mission) to help. They responded generously, a sum of £15,000 was collected, and arrangements were made for the gift to be presented. This presentation was made on a bright Thursday morning in June, as bells pealed from the belfry to call people from the village up the hilltop. Parishioners, village residents and some unsuspecting tourists were on the church grounds when representatives of the local Kendal Branch and Preston Stake of The Church of Jesus Christ of Latter-day Saints joined President and Sister Ulrich of the Manchester England Mission, a number of missionaries, and an LDS choir formed for the occasion. BBC TV and Radio Cumbria covered the event. Reverend John Dixon of St Michael and All Angels opened the meeting by explaining he had first wondered if Brother Brown’s email promising such a large sum might be an Internet scam! He told the audience that although he has delivered many sermons about charity, even he didn’t immediately recognise it from a stranger. He encouraged all to be open to giving and receiving every good gift, and offered his deep gratitude for the donation, which has brought the fundraising near to achieving its full goal. President Ulrich read a moving letter from Brother Brown, then added that as children of a kind Father in Heaven everybody is part of the same family, and every act of kindness rendered to another is a manifestation of that love. He explained how the village of Hawkshead and its picture postcard setting of hills, lakes and forests are choice creations unto the Lord, and that He smiles upon those who inhabit the land. An account was given of how missionaries first came to the region in July 1837, exactly 180 years ago. From there the restored gospel spread from village to village until there were more Latter-day Saints numbered in Britain than in America. A number of performers in The British Pageant joined local Church members to sing How Great Thou Art. 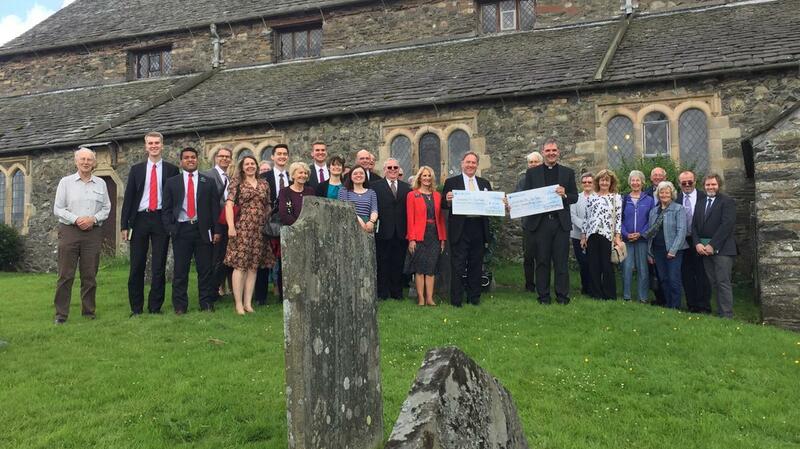 The donation cheque was then presented, but instead of ending the meeting as planned, members of the congregation moved to ask if they could open their hymnals and join in a song of praise. Both faiths united their voices in a rendition of Nearer My God to Thee, and every heart were touched.